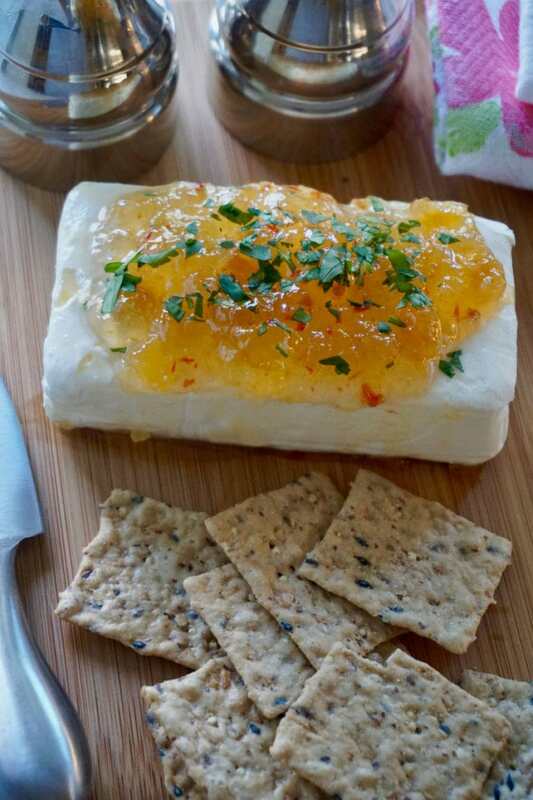 Sweet and boldly spicy Mango Habanero Pepper Jelly, drizzled with gorgeous heat-infused honey and chopped cilantro for flare paired with the cool and creamy brick of cream cheese. 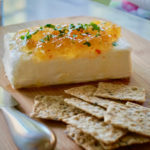 This cream cheese recipe is simply awesome! Paired with crackers of your choice you are going to love adding this spicy, sweet, appetizer to your quick and simple recipe arsenal. 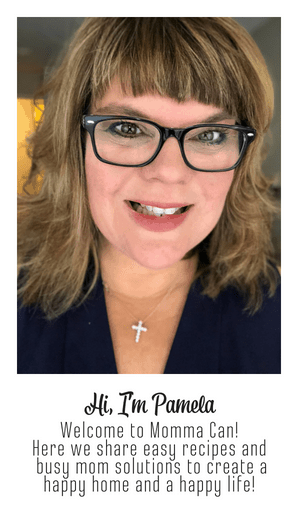 I fell in love with pepper jellies when ordering a box of different jellies from Padre’s Kitchen in Memphis, TN. The chef is actually a pastor of a Catholic Church and creates the Joan Of Arc Jelly ( Habanero Jelly) that was so fabulous that I started stocking hot pepper jellies in my pantry. Padre’s Kitchen sells around the holidays in Memphis otherwise I would be linking this product to purchase because they are all so good. Today I used a wonderful mango habanero jelly from Aloha from Oregon. ( not an affiliate, but still awesome). I loved the red flecks of habanero to add visual interest to the jelly. It was truly fantastic. The honey was purchased here and is infused with a bit of heat but not overwhelming. I love to add a little extra honey to pair with the cane sugar, it gives just a little more layers of flavor to the recipe. The cilantro helps to balance some of the sweet and the cream cheese will help cool down your tongue a bit. It is so fantastic. I tend to use organic cilantro and keep dried in my pantry in case I can’t make it to the market for fresh. I love this brand. Simple Organic Dried Cilantro. 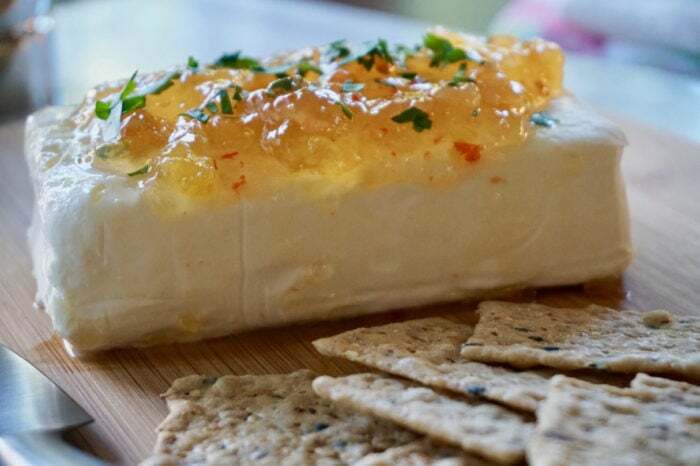 Any cracker will do to serve this delicious pepper jelly cheese spread. I love to use heart artisanal crackers to prevent breakage while snacking. These are brown rice artisan crackers from Blue Diamond. HOT TIP: This recipe is spicy! Tell your guests ahead of time before they dig in. Sometimes I dress the plates with jalapenos and habaneros as a little warning or create a place card. Simple and tasty recipe. 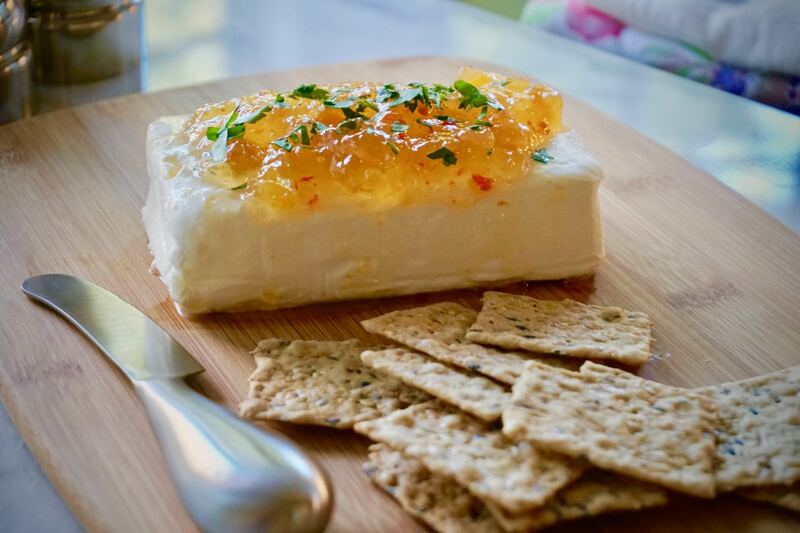 This habanero pepper jelly and cream cheese spread is the perfect addition to your appetizer arsenal! 1-2 tablespoons spicy honey or whatever you have on hand. 1 tablespoon finely chopped cilantro – optional but sure makes it pretty and compliments the flavors! Spoon Mango Habanero Pepper jelly on top of the block of cream cheese. (I take the spoon a mix it up in the jar a bit to break it down. It is simpler to spoon onto the block of cream cheese with this added step. Drizzle honey on top. About two good squeezes. Sprinkle chopped cilantro for added color. Serve with sturdy artisan crackers or on bagels! So good! For added flavor try adding some lemon or orange zest to the habanero jelly. Just make sure to mix it well! If you like this recipe you will love our Pumpkin Spice Cream Cheese Dip!